I’m thinking the stain was by Cabot. We have a rough sawn cedar fence that’s 6 years old. We previously used a transparent oil based stain, not sure of the name, something Australian. How would we prepare our fence for your semi transparent stain? We have a 7 year old treated pine deck, have applied a waterproofing oil similar to Thompson's twice (year 2 and year 4), and now we've decided to go with a semi-transparent. After pressure washing and taking loose slivers off with an orbital sander, I came across your product and ordered it (and it arrived today). In the meantime I was surprised to notice that water still beaded if I tossed a small amount onto the deck when dry (any significant rain hasn't beaded in a while) - so I promptly got some stain stripper from our hardware store and gave the deck a good cleaning this evening. Now as I review your website and deck-prep tips, I'm kicking myself for not just ordering the RAD stripper/brightener when I purchased the stain. Do I have to worry about any problems, or have to consider anything else since I used this other product. It was called Natura Safe Strip - exterior paint and stain stripper. Hard to say. Please post a picture of the current condition. You can see a few spots where I had thrown a bit of water on to test for beading. It looks stripper enough for staining but you should brighten the deck first. Thanks a ton for the good advice and quick replies. Considering that we appear to have a window of good weather early this week, busy schedules, and that we'd have to order the brightener, I think we'll live with a darker look and get the job done asap. Please let me know if I'm overlooking something. Thanks again for the help. You should be okay but you might want to check and see if a local store has a brightener. It will help the appearance. It is time to stain my deck again. I used AC semi-solid the last time. You all recommend to use the Restore-a-deck 2 part kit but do I need to pressure wash it before using the cleaning kit? Could I pressure wash instead of the kit? You pressure wash while using the kit. Both need to be done. 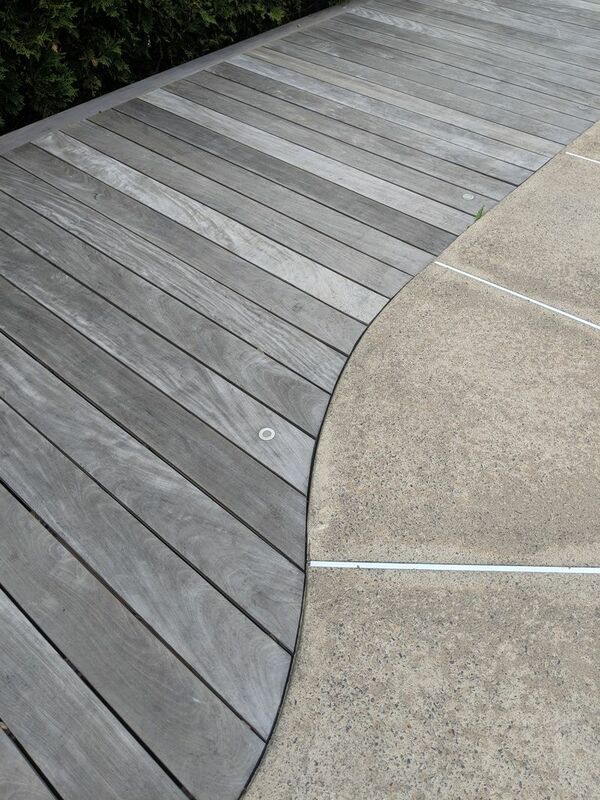 I have a 2-year old red balau deck that has mesmers deck stain on it (applied last summer), should I sand off the old stain before applying your product or is stripping it sufficient prep? If your stripper is ok should I also use the brighter as well? Also for a “wet look” what product would you recommend? Yes on the brightener. Try the AC in Amber color. I'm about to re-stain my hardwood deck with your amber stain. I called one of your suppliers and they said to prep it to just wash it with dawn soap. Do I need a brightener? It was not mentioned so I go the feeling it should not matter, but what I've read online says to use a brightener. For the prep, you should use both a deck cleaner and a wood brightener. Just purchased new Redwood for fences. Boards will be weathered for two-three weeks. Is that long enough? Planning on Sierra Redwood semi-transparent stain. Clean and Brighten needed? Thanks. Smooth. Live in Arizona so heat a factor in drying/weathering. Will that speed up process or do I really have to wait at least 4 months. Thanks again. You will have to wait 2-4 months and do the prep. I have a 6 year old treated pine deck, stained 5 years ago (not A-C, not sure of brand). I have sanded deck down to bare wood and intend to pressure wash it. It is very dry (central Texas). Do I need to to use any of your prep products prior to staining? Do you reccomend Semi transparent or semi Solid? Light pressure wash will help open the grain of the wood after the sanding. Apply just one coat of the AC. Either semi-trans or semi-solid. I want to refinish some teak deck chairs that are grey. Can I use the 2 step deck cleaning process and then finish with a teak oil? this ipe is not for a deck, it is t+g soffit that has to be installed in a week, should I sand with 80 ? Do we also need to sand? Or just doing the deck prep kit enough? In which situation do we want to sand? I stained my IPE deck 2 years ago (clear no color) and now colors is gray but the surface is smooth and nice I want to give it the "Amber" color that you sell. Just the prep kit typically is needed. Sanding would only happen if you let the wood oxidize (turn gray) too much. Amber looks great in IPE! So ( please see pic) you would sand this deck then do the prep kit on it? Do you think I can do it without the sanding?? Just use the prep kit. when you mean pre-kit, you mean the RESTORE-A-DECK KIT or the RAD STAIN STRIPPER/BRIGHTENER KIT given the pictures above? More info for "Can I put the armstrong clark rustic brown over sanded treated lumber. I stripped four coats of paint off a small porch. It's old and so not perfect and I don't expect it to be. It will be "rustic?" As long as the wood is free of the old paint and you do the final prep of the Restore A Deck Kit. This will help the stain to soak in deeper. Can I put the armstrong clark rustic brown over sanded treated lumber? I had a cedar deck installed one year ago. The installers said to leave it for one year and then seal it. What prep do you recommend and which stain? My goal is to keep it as close to the natural color that it is right now but maximize protection. Also, how often will I need to redo this and how long will the leftover sealant last? I have around 450 square feet and I'm thinking a 5-gallon drum might be too much, but if I could save it for a couple of years for a 2nd coat, maybe that would be a good idea. Thanks. Prep with the Restore A Deck Kit. You can use any color you like. Redo every 2 years. Shelf life is 12 months for an opened container. Hello. I have a new (5 month old) Cedar deck. I just used the Restore-a-deck cleaner and brightener and now I have wood fuzziness. I see a lot of varying opinions on what to do about the fuzziness prior to oiling from sanding to using an orbital floor buffer. What does AC recommend? If sandpaper what grit? Should the whole deck be done or only those boards most affected? Only if needed, light buff off the excess wood fibers with 80 grit paper. You will need to do all so it stains evenly. Do it matter how wet the deck is before you begin the stripping/brightening process. We are expecting heavy storms for 2-3 days. Once they stopped, I wanted to strip/brighten and then let the deck dry out before staining. Thanks. The wood can be wet when you do the prep. No issues. I have about 10 year old pergola which I sanded to expose bare wood (which is completely dry), Do I need to clean and brighten it as well even after sanding it down to bare wood? You should be okay to stain it now since it is vertical wood. Yes but no clean and brightening needed before stain? Sorry. Yes, you should lightly prep to remove any sand dust and this will also help to open up the pores of the wood for the AC stain to soak in deeper. How do you apply the prep products on the deck and especially on upright spindles and on a pergola? Use a pump sprayer to apply the prep products. If I have put on a coat of AC a year ago and want to do another coat this year do I need to do both RAD cleaner and brightener? Original coat has held up well but a bit faded on the horizontal boards of the deck, so would like to bring back the great original color. Would be using same color as the original application. In May of 2016 we had a screened in porch built with pressure treated lumber. In the Fall of 2016, we stained the porch. While the wood wasn't as dry as we would have liked, we wanted to stain before it went a whole year with no stain. We used your cleaner, brightner, and cedar semi-transparent stain. When is it best to do a maintenance coat? I'm not sure how deep it penetrated the first time. I'm wondering if the cleaner will take most of the stain off before the maintenance stain coat? And if the overall color would go deeper with second coat of stain? Guess just looking for your advice/experience as restaining our porch is a big job. Thanks. 4 weeks ago I had a redwood fence installed. The vertical boards are rough cut, the horizontal 2x6 and 1x4 boards on the cap are not. Planning to stain in the next couple weeks with semi-transparent, will any preparation be necessary? You should be okay as long as the wood is clean and dry. That is rust must likely. The brightener should help with it but whenever it gets wet again, it will rust. If I use wood stripper, should I use wood cleaner first? 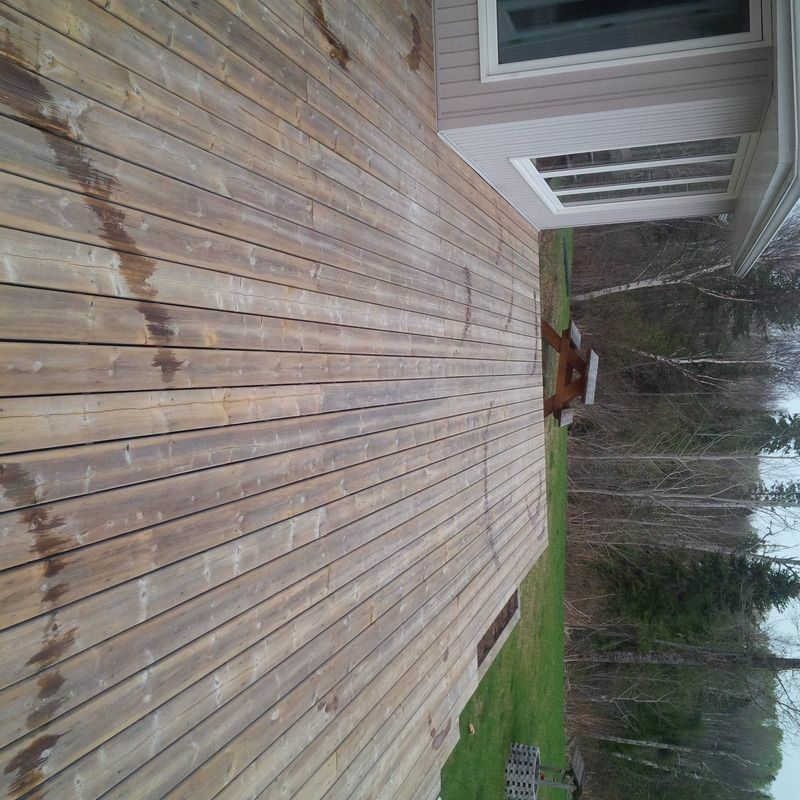 One year old deck with oil based/acrylic stain in place. If using a stain stripper, you do not need to use a cleaner. Brightener after the stripping. Love our AC deck stain in Sequoia (on redwood). First applied, then easily reapplied 2 years ago. But now the house was painted, and we're wondering if we can change to a different AC stain. Steps? Thinking Oxford Brown or possibly Walnut.